I’ve recently started to write online again for the Journal of the History of Ideas blog (where I’m also an editor) over at jhiblog.org. The post below was originally posted on January 23, 2015; visit the original for additional comments. Historiography can sometimes seem like a zero-sum game. New facts come to light and old politics set different lines of battle. One school of thought supersedes another, or at least vociferously claims to do so turning and turning in widening gyres. An outstanding instance of this can be found in the historiography attending Vichy France. The groundbreaking work of Henry Rousso, Robert Paxton, and others shifted the equation between les années noires and collaboration of varying shades during WWII. These years were indeed dark and full of suffering under the German occupation, as testimonies like Jean Guéhenno’s will always remind us. Collaboration of both the active and passive sort is a much trickier phenomenon to discuss and, as Rousso’s great Le Syndrome de Vichy de 1944 à nos jours (English translation) demonstrated years ago, the unique qualities of the episode necessarily carry repercussions through to the present day. As one political impasse falls away and collective memory distorts or corrects itself (in stages as Rousso famously argued), attention among historians has shifted decisively towards studying the active collaboration of the Vichy regime. Yet surely passive, contingent, and the most banal sort collaboration deserves further attention as a clear point of contact between the two schools of historiography which do not, finally, exclude one other. How many frames of reference can we keep without sacrificing clarity? 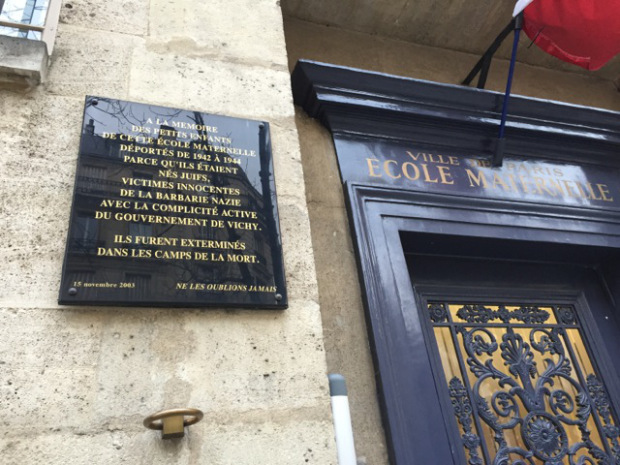 The current exhibit on Vichy collaboration at the Archives nationales in Paris (with the participation of INA and the Mémorial de la Shoah) strives wonderfully to keep this balance. Upon entering, one immediately encounters an overarching distinction between “collaboration” and “collaborationnisme,” namely active collaboration as a matter of state policy and ideological choice. The former haunts the exhibit throughout, however, and complicates what might have otherwise proven a simpler—if still dark enough—chronicle. One sees a celebratory photograph of Marshal Pétain mounted in the display window of a marked Jewish shop, anti-Semitic tracts published by Gallimard and other French publishers of note, advertising efforts for the Vichy welfare state, letters of denunciation, and posters advertising worker exchanges to free POWs in German camps, to say nothing of murkier instances like Joseph Joinovici’s accommodation of the Vichy regime. This does not amount to a social history of life in Vichy France, of course, but it shows that “collaborationnisme” proves a more complicated matter than one might first think in terms of ideology as well as popular support. Responsibility is another matter. The Archives nationales exhibit also includes state directives and communiqués aimed at persecuting French Jews, documents which detail the economic cooperation (“la collaboration constructive”) between the Vichy and Nazi regimes, photos of interment camps at Drancy and elswhere, displays dedicated to Louis-Ferdinand Céline and Lucien Rebatet, and the personal effects, decorations, and photos of members of Milice française as well as of La Légion des volontaires français contre le bolchevisme [LVF] fighting alongside the German Wehrmacht. All told, the exhibit does not shirk any point of controversy of which I know—albeit with the exception of the British attack on Mers-el-Kébir. 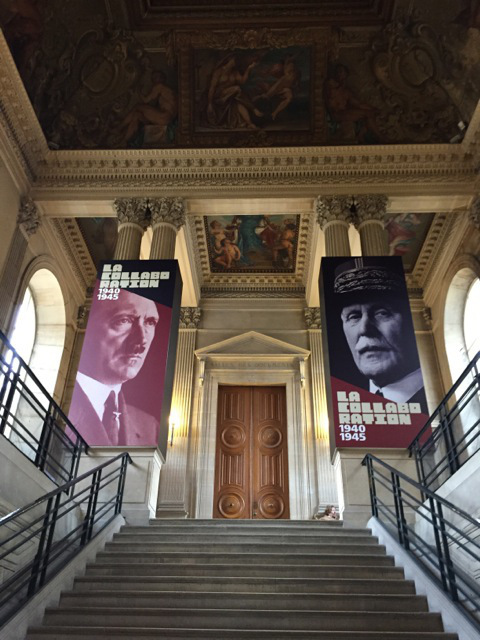 Otherwise, the presence of German soldiers, diplomats, and texts strike a running counterpoint through the exhibit, but the detailed chronologies offered by the exhibit track both when and how much direct responsibility fell to the Vichy government, not least in the matter of direct police collaboration. The exhibit succeeds through sheer thoroughness and embrace of complexity. What struck me again is the relatively high proportion of text to objects, to say nothing of the sheer number of documents also presented as items of interest in their own right. (I’m led to believe there might be a higher tolerance for wordier exhibits in France, but then again we should also consider the venue, curatorial aims, and academic involvement in planning the show.) There were occasional ‘object’ misfires of the sort I discussed in my last post: visitors stumble upon Pétain’s working desk much as he left it when in power, Jacques Doriot’s LVF service trunk, and so on. Yet what proved most impressive was the relatively open historiography. The années noires peeked out from photographs as much as the names of victims on police registers. Passive collaboration flowed into active collaboration and vice-versa. And while some subjects escaped greater attention—say gender or education—the exhibit offered an encompassing take on its primary subject, namely collaborationnisme. Why is this important today? To return to Rousso, I think it marks another stage of the changing historiography around Vichy France—one reaching beyond professional consensus to something like politics and the public. The exhibit naturally received state funding and the support of various government departments. 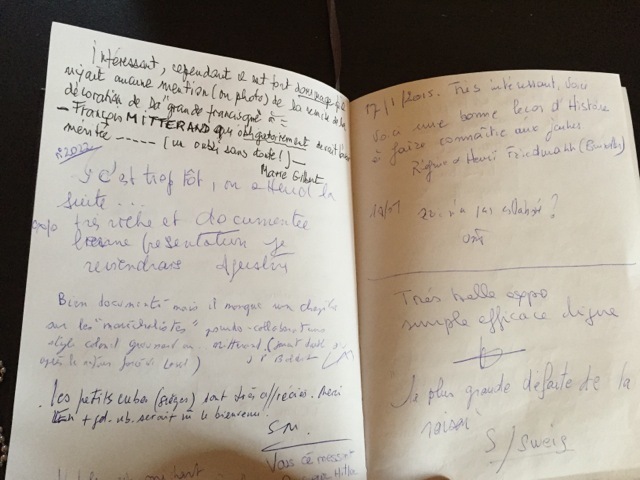 It follows upon François Hollande’s dedication [PDF of text] of the Mémorial de la Shoah at Drancy in 2012. And there has not been much controversy attending the Paris show. Here I would argue that museums achieve or consolidate a state of history that books and arguments alone cannot quite accomplish: not a reconciliation of historiographical schools so much as an open balance preserving the sheer complexity of wartime France, one floating between facts, objects, and texts as much as residing within them. Two final notes: the exhibition catalog did not strike me as particularly well-assembled, but no doubt there’s material to be had within that would prove difficult to obtain otherwise. I am also well aware of the difficulties inherent in discussing Vichy France and here invite experts to chime in and correct or add to my post (especially any fortunate enough to have seen the exhibition).